Last week I attended the Museum's annual winter ball along with about 500 other people. As always, the event was a lovely black tie evening with a parade of NY's most fashionable women turned out in their finest designer gowns. The sponsor this year was Carolina Herrera and Mrs. Herrera was there in person, as were several other designers. I noticed two trends in accessories amongst all the elegantly dressed ladies: giant earrings and lucite evening bags. Both of these styles are having a big moment right now and with both styles being very flattering and chic, I think we'll be seeing a lot of them this Spring. Large earrings have been around for a while, but this season they've gone extra dramatic and sparkly with some even grazing the shoulders. 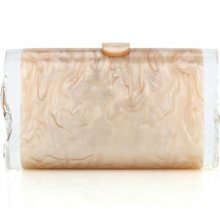 The lucite bags are a style resurrected from the 1950's and very Hollywood glam. I have been an admirer of lucite bags for a long time so I'm thrilled they are back in a big way. I have a vintage one that I will be carrying out for an upcoming event, but the new ones are simply fabulous. The bags known as lucite are also sometimes called resin or acrylic, but all are essentially different chemical compound mixtures that are versions of high quality plastic and trademarked under different names. The beautiful ladies at my table all looked amazing and I ran into other friends who had also paid great attention to accessorizing their outfits to perfection. Some of the ladies work in the fashion industry and some, like myself, are just connoisseurs of fashion. Unfortunately some of the photos are a bit dark because the room was dimly lit, so I hope you can see everything in its splendor. If not you'll have to trust me that these women know how to rock an accessory (and an outfit)! Swimwear designer Elizabeth Kosich carried a beautiful multi-colored resin bag by Brazilian company, Sobral. Town & Country's Micaela English looked lovely in a plaid Carolina Herrera gown and carried a sleek Edie Parker vintage style lucite clutch. The same Edie Parker clutch from the Stanley Korshak site. My vintage lucite bag. I did not carry this to the MCNY event, but wanted to show what a vintage one looks like. This was a great find at an antiques store in the Hamptons about 12 or 13 years ago for the bargain basement price of $80. The new versions cost several hundred to over a thousand and the best vintage ones can run several thousands of dollars, but they are rare and highly collectible. Mine is not of the highest quality, but it is still a nice one, in great condition and I love it.